VA 500: Appeared in August 1928 as a renumbering of VA 1013 from US 117/VA 10 (now US 58) along Laskin Rd to Atlantic Ave, then replacing VA 101 around Cape Henry over to the Lynnhaven Inlet area, then as new routing over to Ocean View and Willoughby Split. About 1930, US 60 was added to VA 500 from Ocean View around to Laskin Rd. In 1932, VA 500 east was truncated to Shore Dr at Pleasure House Rd, replaced by VA 12 over to Virginia Beach and VA 501 on Laskin Rd. In July 1933, the rest of VA 500 was dropped from US 60. VA 500 Ocean View to Virginia Beach. VA 500 truncated to Pleasure House Rd. 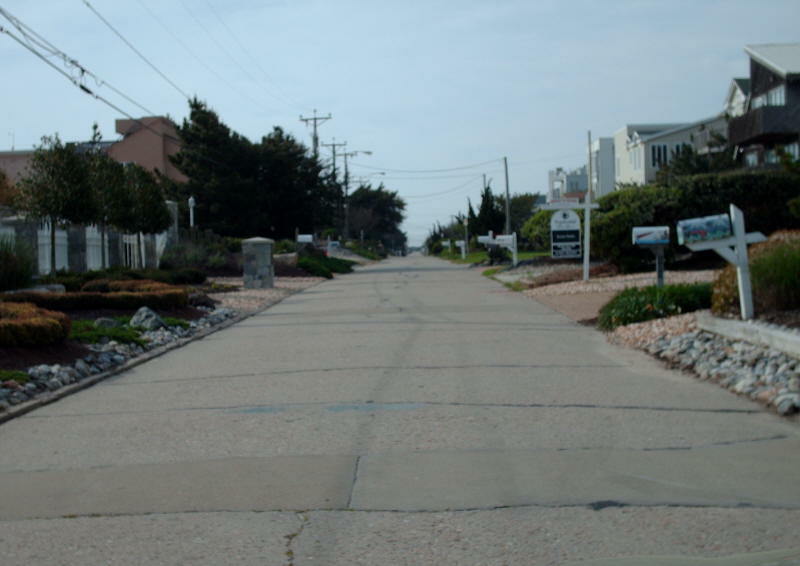 VA 501 #1: Appeared in August 1928 as replacing VA 101 from Atlantic-Laskin jct south to Virginia Beach Blvd (then-US 117/VA 10), then 1.7 miles further south across Rudee Inlet to Camp Pendleton (Rifle Range then) as new routing. In 1932, VA 501 was renumbered as part of VA 12. Today it is unnumbered north of 17th St; US 60 from 17th to Rudee Inlet; unnumbered S. Atlantic Ave below Rudee Inlet. See second scan in VA 504 entry. VA 501 #2: Appeared in 1932 as a renumbering of part of VA 500. Ran on Laskin Rd from US 58/VA 10 to US 60/VA 12 Atlantic Ave. In July 1933, VA 501 was renumbered to VA 164. Today it is part of US 58. See second scan under VA 500 entry. VA 501 #3: The highest number to be used three times in Virginia, VA 501 was born in July 1933. It began in Buena Vista, duplexing with US 60 to Lexington, then north with US 11. Then it replaced VA 805 and VA 805-Y to Goshen; VA 17 to Millboro Springs; VA 804 and VA 804-Y through Warm Springs west to short of the West Virginia line. In Aug 1933 (CTB), VA 501 was extended west to West Virginia, meeting WV 39. It appears by Oct 1934, VA 501 was removed from US 11 (today's US 11 Bus) and US 60. Note that in Buena Vista, VA 501 began at Alleghany at 29th, using Alleghany to Orchard over to modern 60. About 1938, VA 501 was extended south slightly to the new US 11 approach over the Maury River when US 11 was removed from the covered bridge. The new endpoint is today's US 11/SR 681 jct. In Oct 1940, VA 501 was renumbered as VA 39. It is still mostly VA 39 except in Rockbridge Baths it used today's SR 722; It used SR 681 between US 11 and I-64. In Goshen, it is unclear if VA 501 became VA 39 mainline first or was directly renumbered to VA 39 ALT. VA 501 definitely did not move when VA 42 was rerouted around the north of Goshen. 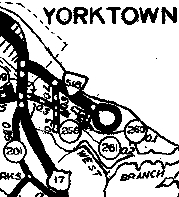 VA 501Y: Created Dec. 1938 in the CTB Minutes as a 0.04 mile connection to US 60. Because the primary routes in Buena Vista were different up to at least the late 1930s, it is not entirely clear where this was although I believe it may have been what is today the northernmost 0.04 mile of today's US 501 (the original VA 14 and maybe US 501 at first used Factory St to get west of the railroad then moved north to VA 13/US 60. Don't know when VA 501Y was terminated but it does NOT appear in the 1941 VDOT Route Log. VA 502: Appeared in August 1928 as new routing running from VA 27 (now VA 168 Bus) Great Bridge east to Princess Anne, then replaced VA 1012 northwest to US 58 Virginia Beach Blvd, then as new routing through the Waterworks area to connect with and replace VA 101 to just short of VA 500 (now US 60 Shore Dr). 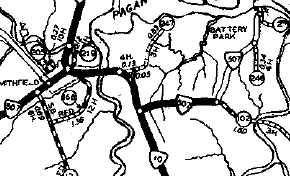 In Aug 1929 (CTB), VA 502 was extended northeast the 0.75 miles to VA 500. In 1932, VA 502 north was truncated to the Waterworks, replaced by VA 12. Today this is what remains of VA 165Y, US 13 Northampton Blvd, Shell Rd from today's Northampton Blvd.-Diamond Springs Rd. jct northeast to Pleasure House Road where it cut north to Shore Dr.
See scans under VA 504 entry. In July 1933, VA 502 was renumbered as VA 165. It still is VA 165 except in Kempsville VA 502 used Parliament Dr; In the North Landing area VA 502 used Bellpage Ave. US 17 NB: VA 503: Appeared in August 1928 as new primary routing running from US 117/VA 10 (now High St at Constitution Ave) Portsmouth west to the Nanesmond County line. 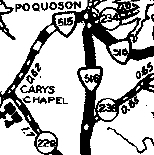 In Aug 1929 (CTB), VA 503 was extended west 1 mile. In Dec 1930 (CTB), VA 503 was extended west 3.3 more miles to "the end of the concrete road" which was about where US 17 and SR 627 meet in the Crittenden area. In 1931, US 17 was added to the entirety of VA 503. In July 1933, VA 503 was dropped in favor of US 17. Today it remains High St and US 17 except VA 503 used Churchland Blvd in Churchland. VA 504: Appeared in August 1928 as new primary routing, running from US 17/VA 40 (now US 17 Bus) Deep Creek northeast to the Gilmerton Area, then duplexed with VA 27 southeast to Great Bridge, then continued as new primary routing northeast to the Princess Anne county line. In Dec 1930 (CTB), VA 504 was extended northeast to VA 502 (now VA 165) Kempsville. In July 1933, VA 504 became VA 166. Today, it is VA 165 out of Deep Creek, Cedar Rd; US 17; VA 166 Bainbridge Blvd; VA 190 to Kempsville. VA 505: Appeared in August 1928 as a renumbering of VA 103, running from US 58/VA 12 (now VA 337) Suffolk south to the North Carolina line near Corapeake, NC. See scan under VA 507 entry. About 1930, it appears VA 505 was removed from today's Old Somerton/Airport Rds, leaving behind CRs 232/247. In July 1933, VA 505 was renumbered as VA 52. Today it is VA 32 and VA 32 Business except right in Suffolk it used Saratoga St.
VA 506: Appeared in August 1928 as an upgrade to CR 3. It ran from VA 505 (curr Old Somerton Rd/Airport Rd) near Suffolk southwest 9.45 miles to the Whaleyville area. See scan under VA 507 entry. About 1930, VA 506 north was shortened slightly when VA 505 was placed on current VA 32's routing. So part of VA 506 became part of VA 505. In July 1933, VA 506 became VA 53. Today it is part of US 13. VA 507: Appeared in August 1928 as a renumbering of VA 108, running from the NC State Line to Franklin (also part of US 117), then northeast to Windsor and Isle of Wight CH before ending at VA 10 Smithfield. There was a 4 mile gap between Windsor and Isle of Wight CH. In Dec 1930 (CTB), the gap in VA 507 was closed, plus the route was extended east from Smithfield towards Rescue. In July 1932 (CTB), VA 507 was extended east 1.97 more miles towards Rescue, ending at today's SR 1006-1005 jct. In July 1933, VA 507 became US 158 from N.C. to Franklin and VA 158 everywhere else. Today it is essentially US 258 from NC to Smithfield; US 258 Business through Smithfield; SR 704 over to Rescue (rerouted on newer bridge over Jones Creek - VA 507 used SR 1006). Note that in Franklin, VA 507 used US 258 Business except it used High St to 4th St.
VA 508: Appeared in August 1928 as upgraded routing, running from VA 35 near Courtland northeast to VA 52 (now SR 600) near Ivor. About 1930, VA 508 was extended north to the new VA 52 route (current US 460) Ivor, replacing some of the old VA 52. In Dec 1930 (CTB), VA 508 was extended northeast 3.25 miles. In July 1932 (CTB), VA 508 was extended northeast again another 1.8 miles towards Proctors Bridge. Also, a second piece of VA 508 was created, running from VA 507 (current US 258 Bus) Smithfield west to the Septa area. In July 1933, both pieces of VA 508 were renumbered as VA 33. Today the original piece is SR 616 and the second piece is SR 626. 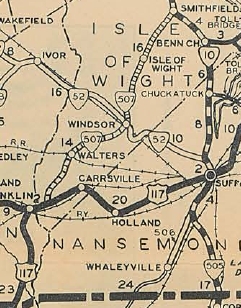 In Dec 1930 (CTB), VA 509 was extended southeast to the Southampton County Line. Also, a second piece of VA 509 was born, running from VA 35 Boykins west through Branchville. In 1932, VA 509 was extended north through Emporia with US 17-1 and US 58, then replaced VA 534 about 2 miles towards Purdy. In July 1932 (CTB), VA 509 was extended northwest to Purdy. Also, the second piece of VA 509 was extended to meet the first at the Greensville/Southampton Line. In July 1933, VA 509 became part of VA 32. Today this is SR 619 from Purdy to Emporia; Westend Dr near I-95; US 58 Business; US 301; SR 730 Emporia to Branchville; VA 186 to Boykins. VA 509 extended to Boykins. VA 510 #1: Appeared in August 1928 as a renumbering of VA 392, running from the SCL of Wakefield west of VA 52 (now US 460) to VA 10 Surry; Jamestown to US 60/VA 39 (Duke of Gloucester St at Jamestown Rd). 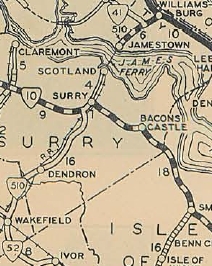 In Dec 1930 (CTB), VA 510 was extended north 1.37 miles from Surry. In March 1933 (CTB), a permit was granted to Eastern Virginia Bridge Company to build a bridge between Scotland Wharf and Jamestown Island. In July 1933, VA 510 became part of VA 31. From Jamestown to Williamsburg it is VA 5, VA 31, SR 682, west along today's Colonial Pkwy, then cut south at the parking area to a causeway (still visible on Google Earth) and crossed Thoroughfare Creek onto Jamestown Island to meet the ferry in the area of the historic settlement. VA 510 #2: According to the 2001 and 2003 VDOT route logs, a proposed VA 510 will be built from I-564 to the US Naval Base and International Terminal. In 2012, the project now known as the I-564 Intermodal Connector received the go-ahead. This road would run from I-564 near Chambers Field over to a new interchange near Hampton Blvd, connecting to N.I.T. and the southern part of Naval Station Norfolk. It will line up with the planned Patriots Crossing ("the thrid crossing") over to I-664 just south of the south tunnel entrance at MMBT. The link above implies the connector might be part of I-564. No current document associated with the project retains the VA 510 designation. VA 510Y: Appeared in June 1931 (CTB) as a 0.5 mile route from route 39 to Eastern State Hospital. Back then, this facility was east of William and Mary College. Shown but not labeled on the 1932 Official using either Nassau or Palace St south from Duke of Gloucester to Francis then west to Henry and south to the Hospital entrance. It is unclear what happened to 510Y in July 1933. 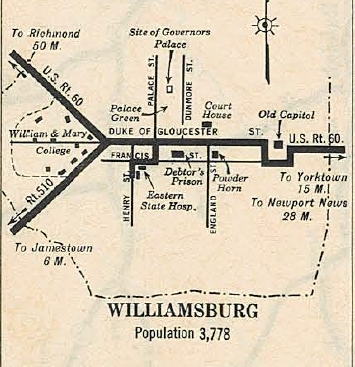 The City of Williamsburg's primary designations were not established until Aug 1934 CTB, but the general corridor 510Y used is in the 1934 description. Did it become VA 31Y? Did it become one of those unnumbered primary extensions within an independent city? Much later some of this became part of VA 132. VA 511: Appeared in August 1928 as new primary routing, from VA 514 (Queen St) Hampton south towards the James River via Back River Rd, Shell Rd and La Salle Ave. In Dec 1930 (CTB), VA 511 was extended south 0.40 miles to the waterfront. In July 1933, VA 511 became part of VA 167. Today none of this is primary routing. VA 512: Appeared in August 1928 as a renumbering of VA 394, running from VA 39 (now VA 143) Phoebus east to Buckroe Beach. In July 1933, VA 512 became VA 169. VA 513: Appeared in August 1928 as new primary routing replacing CR 3, running from Hampton northeast 4.1 miles. VA 513 did not initially connect to any other state highway. 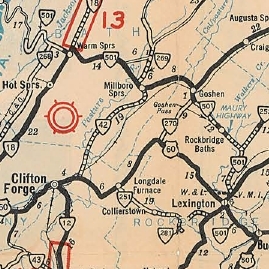 In Dec 1930 (CTB), VA 513 was extended to Grand View. VA 513 was also connected to the rest of the state highway system when VA 533 was created. See scan in VA 512 entry. In July 1932 (CTB), VA 513 was extended from Hampton east 1.27 miles towards Buckroe Beach. In July 1933, VA 513 from Hampton to Grand View became part of VA 167 while the piece towards Buckroe Beach became part of VA 168. Today, VA 513 is part of VA 351, King St, a bit of VA 278, Old Fox Mill Rd, VA 169 and Beach Rd out to Grand View. VA 514: Appeared in August 1928 as a renumbering of VA 391, running from US 60/VA 39 Lee Hall east to Yorktown, then south into Elizabeth City County. VA 514 was then added as new primary routing to continue to Hampton, ending at VA 39 (now US 60/VA 143). US 17 was also assigned to VA 514 from Lee Hall to Yorktown. 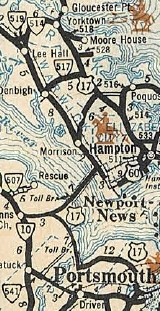 In 1930 (Bridge date), VA 514 was rerouted in the Poquoson Area. Initially, it followed today's VA 172 into Poquoson, then Yorktown Rd southwest, a little VA 171 and SR 706 Yorktown Rd over to Tabb. In 1930, VA 514 began using today's VA 134 from Wythe Creek Rd northwest to Tabb. The old route became an extended VA 516 on Wythe Creek Rd, then CRs 229 and 2. About 1931, US 17 was instead assigned to VA 514 from Tabb to Yorktown. In July 1933, VA 514 became part of VA 170 from Lee Hall to Yorktown; US 17 Yorktown to Tabb; VA 27 Tabb to Hampton. Today it is VA 238 Lee Hall to Yorktown; SR 1020 through Yorktown; SR 704 then US 17 Yorktown to Tabb; VA 134 Tabb to Drummonds Corner; VA 172 Drummonds Corner to NASA; Armistead Ave to Hampton; Back River Rd and Queen St in Hampton. VA 515: Appeared in August 1928 as new primary routing, running from US 17-60/VA 39 Morrison north to VA 514 (now Yorktown Rd) Tabb. See scan under VA 516 entry. About 1931, US 17 was assigned to VA 515. In July 1932 (CTB), a second piece of VA 515 was created, running as a stub off VA 516 (now VA 172) Poquoson west towards Tabb. July 1933, VA 515 was dropped from its original route in favor of US 17 (now this is VA 306; Harpersville Rd; US 17 and SR 706. The Poquoson stub became VA 171. Today this is plain ol' Yorktown Rd. plus the northernmost 0.1 mile of VA 172. VA 516: Appeared in August 1928 as upgraded routing, running from VA 514 (now VA 172) Poqouson east 3 miles along Poquoson Ave. In 1930, VA 516 was extended south along Wythe Creek Rd to Drummonds Corner, replacing what had been part of VA 514. See scan under VA 514 entry. In Dec 1930 (CTB), VA 516 was extended east 0.5 miles. In July 1932 (CTB), VA 516 was extended again 1 mile to Armory Wharf. In July 1933, VA 516 became VA 172. Today it is still VA 172 to Poquoson, then Poquoson Rd east; then VA 171. VA 517: Appeared in August 1928 as upgraded routing from VA 514 (now US 17) below Grafton to 0.9 miles west of US 17-60/VA 39 Denbigh. 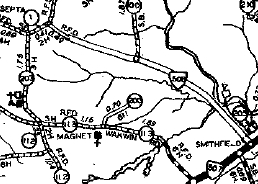 In July 1932 (CTB), VA 517 was extended west to the Warwick River. In July 1933, VA 517 became VA 173. Today it is VA 173 in Newport News (except the zig-zag with US 60 is gone) and SR 620 Oriana Rd in York County. See scan under VA 514 entry. VA 518: Appeared in August 1928 as upgraded routing, running from VA 514 (now SR 1020) Yorktown east to Moore House. In July 1933, VA 518 became part of VA 170. Today it is part of VA 238, plus SR 676. VA 519: Appeared in August 1928 as a renumbering of VA 397, running as a cutoff between US 60/VA 39 and VA 514 (now VA 238) north of Lee Hall. See scan in VA 517 entry. In July 1933, VA 519 became VA 174. Today the road is physically gone between US 60 and the Yorktown Weapons Station (I-64 construction). What remains of the road is Lebanon Church Rd within the Naval Facility. VA 520: Appeared in Aug 1928 as new primary routing, running from US 13-VA 34 east 6.3 miles. This assignment was contingent upon a satisfactory option for a bridge to Chincoteague to become available. In June 1930 (CTB), VA 520 was extended to Chincoteague. In Dec 1930 (CTB), VA 520 was sent south with US 13 to Oak Hall, then west over CR 107 to the railroad tracks. In July 1933, VA 620 became VA 175. Today, the piece west of US 13 is SR 703, while at Wallops Station VA 520 used SR 798 east through the facility to pick up current VA 175 at the west end of the causeway. VA 520 does not show up on the 1929 Official. The extension west doesn't show up on the 1932 Accomac County map. VA 521: Appeared in August 1928 as a renumbering of VA 341, running from US 13/VA 34 to CR 5 (now VA 316) Parksley. In July 1933, VA 521 became VA 176. VA 522 #1: Appeared in August 1928 as a renumbering of VA 342, running from US 13/VA 34 Tasley west to Onancock. In Dec 1930 (CTB), a second piece of VA 522 was created running from US 13/VA 34 (now VA 178-181 jct) Belle Haven west 2.71 miles. About 1930, VA 522 piece 2 was extended from Belle Haven east to Belle Haven Station, replacing part of US 13/VA 34. In June 1931 (CTB), piece 2 was extended 1.5 more miles. By 1932, VA 522 was rerouted at Belle Haven to instead head south to end at US 13/VA 34 Exmore. This was a route swap with VA 526. In July 1932 (CTB), VA 522 piece 2 was extended north 5.65 miles to about Bobtown. In July 1933, both pieces of VA 522 became VA 178. Today the first piece is now part of VA 179 and all of VA 126. VA 522 #2: Appeared in Oct 1940 (CTB) - "It is proposed to extend Federal Route 522 south from Hancock, Maryland to simplify the direction of traffic to the Skyline Drive from north or south"
VA 522 began at US 60 near Powhatan and replaced VA 49 through Goochland, Mineral, Culpeper; replaced VA 3 through Sperryville, Washington, Front Royal, Winchester; replaced VA 7 up to West Virginia. VA 522 is shown explicitly on the Jan 1941 and July 1941 official state maps. The next official map, 1944, shows VA 522 renumbered as US 522. It remains so today except: SR 719 in the Belmont/Lake Anna area; US 211-522 Business through Washington; SRs 679/789 in Albin; SR 684 through Gainsboro; SR loop through Cross Junction. VA 523: Appeared in August 1928 as new primary routing, running from Harborton to Wachapreague via Keller. In Dec 1930 (CTB), VA 523 was extended west 0.20 miles to the Harborton Wharf. In July 1933, VA 523 became VA 180. Today the route east of US 13 is SR 622/696 and the zig-zag of SR 600 and SR 736. VA 524: Appeared in August 1928 as a renumbering of VA 343, running from US 13/VA 34 Eastville east to Eastville Station less than a mile away. In July 1933, VA 524 was renumbered as VA 185. Today it is SR T-631. VA 525: Appeared in August 1928 as new routing, running from US 13/VA 34 Bayview south 8.9 miles to the Townsend area. In Dec 1930 (CTB), VA 525 was extended south 1 mile. In July 1932 (CTB), VA 525 was extended south to Kiptopeke. VA 525's endpoint was at today's US 13/SR 600 jct just north of the CBBT. US 13 wasn't a road then, but the railroad ran right there. In July 1933, VA 525 became VA 186. Today it is SR 641; SR 684; US 13; SR 683; SR 624; SR 600.